Join us for our monthly meeting at the Dennis Senior Center on 4 January at 7:00PM. In addition to the usual business items and pizza, Karen Zunti will be presenting “Kinesio Taping For Common Running Injuries.” An accomplished triathlete, physical therapist and Certified Kinesio Tape Practitioner, Karen will show us how kinesio taping (you’ve seen all those Olympians with weird patterns taped all over their legs and arms, right?) can aid injury recovery for common running injuries like ITBS, achilles tendonitis, patellar tracking, and plantar fasciitis. The holidays are filled with yummy food, and we all looove yummy food. So what do you do in the middle of the winter when all that yummy food starts to weigh you down? You make a resolution. Yeah.. that’s what you need to do. Make a resolution. Resolve to start your road racing year off early and come on out for Plymouths first and newest race of the 2012 local racing scene. 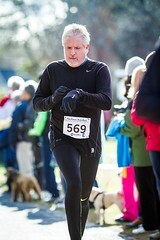 The Winter Warlock 10K. Brought to you by the same team that puts on the popular Old Sandwich Road Race and the fast-growing Thanksgiving Day Pilgrim 5K. Come on… it’s cold outside. Register [HERE].You’ll be glad you did. Weather: This race will happen in any weather conditions. The colder the better! Snow, freezing rain, blowing wind. It’s called the Winter Warlock. Break out your tootsie warmers. Price: $20 online before February 15th. $25.00 on race day. Prizes and giveaways: There will be medals for age groups and overall. No givaway items at this race. RACE DAY REGISTRATION: $25 opening at 10:30AM. Parking: Parking directors will help you to find the parking lots when you arrive. * Treasurer’s report – expenses discussed, reviewed and accepted by all present. * Updates – Bob Edwards recently injured during a fall at the recent Andrea Holden race and as a result, he has sustained 2 broken ribs and a punctured lung. He is in the hospital and is due to go into a rehabilitation facility soon. John Worgan is now home and is resting. John Demarest will be getting a knee replacement. * 1st Grand Prix race held at the Chatham Boatyard is now on the books. GP #2 to be held at Camparis Restaurant. Per Geof, GP scoring is now up on website – refer to new blog posts. Spreadsheet available on SkyDrive – file currently being edited. On-going Club website changes – website now enabled for mobile, i.e., race calendar, etc. * GP Race #3 – Yarmouth Police Dept. – Race open to members and non-members. Two separate timings – Walkers @ 10:30am / Runners @ 11:00am. After-race venue to be determined. * BAA waivers are now in. Deadline to submit them in is 1/13/2012. This may possibly be the last year CCAC will receive waivers. Speak with Bob Eckerson or Joe Weinberger for further info. * Karen Zunti will be doing a presentation at January monthly meeting on taping injuries. 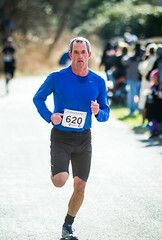 * Big Brothers & Big Sisters – Pete Stringer is looking for donations for his upcoming 50 mile run. Motion to donate $200 was accepted. * Cape Cod Times Needy Fund – motion to donate $250 was accepted. * Old business – CCAC 2012 Banquet to be held on 2/11/2012. Possible venue discussed: The Cove, W.Yarmouth. Food and costs are reasonable. Buffet-style dinner. Rooms are $75 per night. Holds approximately 200 people. * New business – Tom Nally to give tentative idea within month of December regarding the actual size of CCAC membership. Total is needed for insurance renewal, which is 12/31/2011. 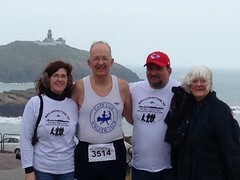 * Relay For Life of Mid Cape – 6/15/2012 – 6/16/2012 – Discussion by Mary Duchesney who is organizing team event. CCAC invited to participate. $10pp – need to raise $100 minimum. Starts 3pm on the 15th and ends the following day, late morning/early afternoon. To be held at Dennis-Yarmouth High School. Team name would be CCAC. Geof Newton to post more info on CCAC website. * USAT Club General Liability insurance renewal– due on 12/31/2011 – estimated $1500 annual premium. Need final club membership numbers for final figure. * Motion to renew USAT club membership for 2012 term was accepted. USATF renewal has been renewed, per Adam Ross @ $75.00. * Geof Newton reports…..Holy Trinity race – 1st year – 5k race – event went well – thanks for all donations which were contributed towards race. Next year’s race will be held on 10/27/2012. 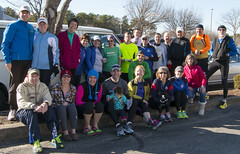 Upcoming – 12/31/2011 – Kate Naples race – more info on website. Nauset H.S. Track & Field Club – starting winter track – speak with Matt Clark for more info. Field a Team for the Seneca7 Relay! It’s back! Registration for the 2nd annual Seneca7 around-the-lake running relay is now Open! Geneva, NY, the heart of the Finger Lakes, is ready to welcome you back (or host you for the first time) as you compete in this great event! 7 member teams, 7am start time, 77.77 miles Saturday, April 28, 2012 Each runner will complete three legs of 2-5 miles each over the course of the day as teams race around Seneca Lake! Please consider adding this event to your race calendar and/or share it with your running friends. You only need a team captain to register, you have until April 16th to enter the rest of your team details. Need to find a team or does your team need another runner? Check the ‘teammate finder’ on the website. Can you stay awake for 24 hours? Mary Duchesney is organizing a club team for the 2012 Relay For Life, a 24’ish hour walk/run/campout around the DY High School track which raises funds for the American Cancer Society. The 2012 DY event will be held on June 15th and will kick off at 3:00pm. Along with individual and group fundraising targets, the goal is to have a CCAC singlet running on the track at all times. 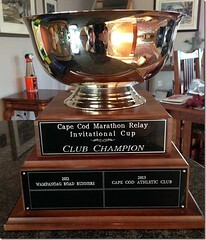 To sign up, go to the DY event page and register as a member of the Cape Cod Athletic Club team. The more that sign up, the shorter the runs! For more information, contact Mary at gooochie@comcast.net or track her down at one of our upcoming races.